On November 13th, a group of researchers from SNU Engineering Department gathered at a farmhouse in Nowon district. After comparing the size of leaves and roots of radishes to those cultivated elsewhere, the researchers concluded that the local radishes were larger and grown with healthier leaves. The purpose of the research was to prove the effectiveness of a new kind of natural fertilizer produced on the grounds of SNU. This eco-friendly fertilizer is the product of the department's newest output: a new type of toilet, dubbed ‘Tori.’ Meaning “beneficial to the earth” in Korean, Tori was developed by the Department of Engineering’s Sustainable Water Supply Research Center (SWSRC). The Center’s chief objective was to save water wasted in conventional toilets, which use water inefficiently. 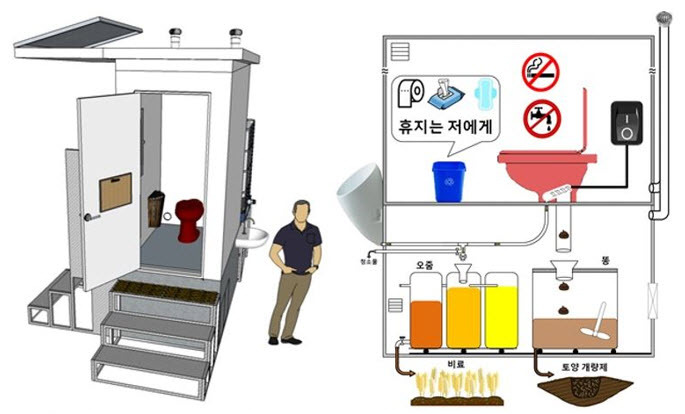 Han Moo Young, professor at Civil and Environmental Engineering and head of SWSRC, explained that the mechanism behind conventional toilets leads to water wastage because they use pure water to flush down waste. Even processing urine in these toilets wastes water, as it takes 2 liters of fresh water just to flush. “In a few decades,” he explained, “our generation will suffer from water shortage, to say nothing of future generations.” It was this dilemma that triggered the development of Tori. Professor Han explained that the convenience of conventional toilets comes at a great cost. In addition to the excessive use of water, conventional toilets’ inefficient system makes it very difficult to produce natural fertilizer. Tori does not need water to operate, and has separate pipes for urine and waste, allowing each to amass in separate chambers. This radically simplifies the process of making natural fertilizer, allowing it to be produced at low costs. SWSRC is optimistic that Tori will be widespread in the future, because it can be installed even in areas which lack water drain systems. Professor Han claimed, "It takes $20-30 to produce 20 kilograms of conventional natural fertilizers, but with Tori the costs are cheaper and the results are more satisfactory. Because the fertilizer is more concentrated it is purer and more effective."